I’m seeing signs of a pullback on the yen pairs these days so I’ll be catching the selloff bandwagon on AUD/JPY. Read on to find out why I picked this pair. This pair has been selling off since mid-March as the higher-yielding Aussie was bogged down by risk aversion while the Japanese yen was propped up. Around the same time, the Land Down Under had been printing a few misses with its economic reports, as well as chalking up declines in iron ore prices. Earlier this week, the RBA announced its monetary policy decision and acknowledged weaknesses in the jobs market. Now this represents a slight dovish tilt as the central bank had previously been brushing those hiring setbacks off. Governor Lowe also shared that housing authorities are taking measures to prevent a property bubble, leading some to speculate that they’re making some leeway for rate cuts if needed. With that, AUD/JPY broke below support around the 84.00 major psychological level and dipped to a low of 83.23. From there, price showed signs of pulling back to the area of interest, which could hold as a ceiling. I decided to short at market on this pullback to the 84.00 region and set my stop past the latest highs. I’m aiming for the mid-November lows near 81.00, which also coincides with a longer-term resistance-turned-support area. I’m open to adjusting my target lower to the next support zone around 79.00 if the fundamental picture remains the same. I’m retaining a bullish bias on the yen because it seems to be taking advantage of both anti-USD action on falling U.S. bond yields and the recent risk-off flows on global uncertainties. As my buddy Forex Gump noted, market themes such as Brexit and European elections are likely to stay in play for the next few months so traders might be less inclined to put money in riskier assets. 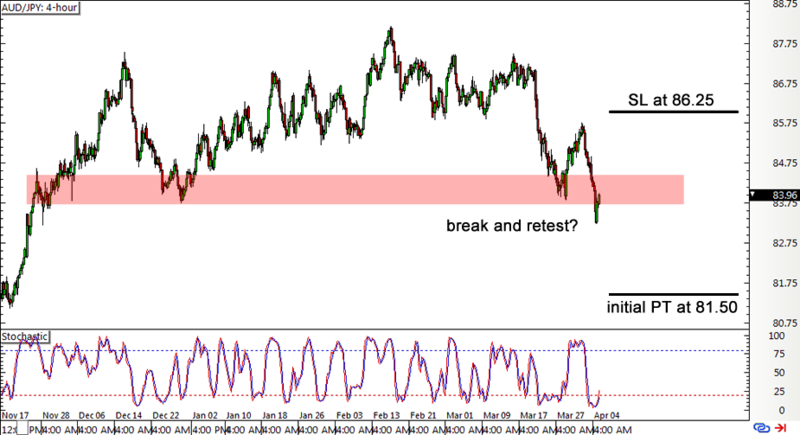 Short AUD/JPY at market (83.95), stop loss at 86.25, initial profit target at 81.50. I’ve risked 0.5% of my account on this setup for a potential 1.06-to-1 R:R. As always, don’t risk more than 1% of your account on a single trade and make sure you read our risk disclosure if you’re thinking of taking the same setups.